American cuisine has been enjoying its moment in the sun recently as our relatively young country reaps the benefits of the revolution that started more than 45 years ago in the Bay Area when “eat local” maven Alice Waters opened Chez Panisse. Last year, New York chef Mario Batali published a “Big American Cookbook” as a tribute to his favorite regional dishes, from San Diego Fish Tacos to Boston Cream Pie. That first taste of the merlot grapes was succulent. Amelia Ceja was 12. It was 1967, and she had just immigrated to the Napa Valley from Jalisco, Mexico. Her father, who had come to the United States several years earlier in search of a better life, had sent his family a postcard inviting them to join him. Mexican migrant workers came to California to pick grapes. Now they own wineries. They came from Michoacan or Jalisco, two agricultural provinces near Mexico City. Their fathers left for El Norte as migrant workers — some under the Bracero guest-worker program, others crossing the border illegally but gaining legal status in a time when papers were easier to come by. They worked in California’s burgeoning agricultural industry before settling in wine country. It is a long way from the mountains of Jalisco, north of Guadalajara, where Amelia Morán Ceja was born and spent her early years, but she still rembembers the vivid colors, aromas and flavors of her childhood there - and still collects them daily in her garden and kitchen in the Carneros, the former sheep-grazing area where Napa Valley eases into the wetlands of San Pablo Bay, east of San Francisco. As part of NBC Latino's "One Heritage, Two Generations" series during Hispanic Heritage Month, the mother and daughter share how their Mexican roots have strongly influenced their family's upbringing as well as their work and their product. In this episode, Bill speaks with Amelia Ceja, a Latina trailblazer in the North Coast wine industry. Her life has been the epitome of the American dream. She came from Mexico as a child and worked in celebrated Napa vineyards. She later joined her family’s winery, Ceja Vineyards, doing various jobs that led up to her becoming president in 1999. She also is an expert on food, especially what wines to pair with Mexican cuisine. Some two million farmworkers grow and harvest our food each day, often working in fields sprayed with pesticides. Former farmworker Amelia Moran Ceja demonstrates that stewarding the land and your workers can be good for business. :Mindful Vineyards” features leaders and advocates from the business, labor and environmental communities, who honor the legacy of Cesar E. Chavez and call for justice in agriculture and protections from pesticides for some of most vulnerable workers in the nation. For the first time in 20 years, Amelia Moran Ceja is in Cabo San Lucas, the sunny resort settlement at the southern reaches of Mexico’s Baja peninsula. She’s finding that the town no longer is a dusty little fishing village as she marvels at the string of hotels, golf courses and restaurants along the 20 miles of beach stretching northeast along the Sea of Cortez to San Jose del Cabo. Amelia Ceja spoke to Today show’s Kristen Dahlgren about her journey from a small village in Mexico to California, where she discovered the love of winemaking and is living the American Dream. In 1967, Amelia Morán Ceja emigrated to the U.S. to join her father, a farmworker who toiled for years in California's vineyards. Today she's crossing another border, turning upwardly mobile Latinos into wine aficionados is with her subtle blend of viticulture, down-home cuisine and a Web-based marketing campaign. The Ceja family would like to change the way people eat. Parents and children alike in this wine-centric house believe it’s important for families to gather around the kitchen table, to take adequate time to enjoy a meal together, to share both highs and lows in one another’s lives. De 400 viñedos 12 son manejados por mexicanos que inmigraron sin nada y ahora son 'los amos del valle'. Dalia Ceja often jokingly tells people, "I don't have blood in my veins, I have wine." Wine has certainly been a part of Ceja's life for as long as she can remember. As a little girl, the Napa-area native remembers playing amid the family vineyards alongside her brothers. In some ways, the 27-year-old still sees the vineyards as her personal playground. So... what's it really like inside the Obama White House? Amelia and Dalia Ceja of Ceja Vineyards in the Napa Valley had a look recently on a private, two-hour tour of the Executive Mansion. The visit was hosted by Daniel Shanks, the usher in charge of food and beverage at the White House since the Clinton administration in 1995. In 1967, a young couple named Pablo and Juanita Ceja left their small village in Michoacan, Mexico, for a new life in the United States. Like many migrants, they wound up in California's Napa Valley, where they found jobs picking grapes in the local vineyards. NAPA, Calif. - When Amelia Morán Ceja and her brother-in-law Armando Ceja look out at the vineyards around her house, they can also see the past, when their fathers traveled from Mexico to harvest fruit in stifling heat for meager wages. Ms. Ceja can still feel the grape juice on her hands, made raw from helping her father tend the vines in fields just like these. Shrimp are marinating in cayenne and paprika. Serrano chiles are going under the knife for the sake of the guacamole. Longaniza sausage is giving up its fat in a frying pan. A feast of Mexican home cooking is in the works in the Ceja family's kitchen. And there's not a margarita nor Dos Equis in sight. Lunch begins with lightly smoked salmon. "You have to drink our 2000 Chardonnay with it. It comes from right out there." Amelia Moran Ceja is standing at the stove in the family kitchen, gesturing toward the vines 250 yards from her front door in the Carneros district of southern Napa. Until she was 12 years old, Amelia Ceja lived in the small Mexican village of Las Flores—population 60—about 350 miles northwest of Mexico City. There was no electricity or running water. “We took our water from the river,” Ceja, now 46, recalls. After decades of working as farmhands in California wine country, it should come as to no surprise that Latinos have ascended the ranks of winemaking to become their own bosses, running their own vineyards with their top-to-bottom experience in viticulture. With titans like Mondavi having been credited with defining an era modern American wine, it’s easy to overlook the reality that the Latino community’s ties to the wine industry run just as deep and are just as strong as the ties of the landowners. Amelia Morán nació en Las Flores, una localidad en los Altos de Jalisco, sin agua potable ni electricidad. Bajo la tutela de su abuela, Mamá Chepa, tejió un vínculo con la agricultura y alimentó a su familia con la cosecha de su propio huerto. A miles de kilómetros de distancia, en California, Oregon y Washington, Felipe, su padre, también sembraba. At harvest time each year, the Ceja family celebrates the American dream, Napa Valley Style. There is a promising crop of grapes on their 113 acres of vineyards which they use both to make into their Ceja brand wine and to sell to other winemakers. In addition, their family garden is overflowing with fresh tomatoes, peppers, beans another vegetables. Earlier this month, Amelia Moran Ceja, the first Mexican-American woman to head up a wine production company, visited Boston. Between sales calls, the president of Ceja Vineyards in Napa, Calif., made her way to Walden Pond. “I could almost hear Henry David Thoreau’s words describing the seasons,” says the literature and history buff. We're thrilled to have some of our favorite family recipes featured and photographed by Sunset Magazine. The recipes include our citrusy salmon ceviche, eggplant salsa, easy lamb birria and Mexican mussels with sausage, mushrooms, and chiles. Ceja, the social media guru for her family's Napa winery, Ceja Vineyards, has made it her mission to shift the public's perception -- and our palates' inclinations -- when it comes to Mexican food and drink. For Amelia Morán Ceja, of Ceja Vineyards, food is love. Born in Las Flores, Jalisco, an agricultural village in Mexico, Ceja said her happiest memories go back to the kitchen on the family farm, helping her grandmother prepare meals. Dalia Ceja had a decision to make. After graduating from San Francisco State University in 2008 with a degree in marketing and communications, living and working in San Francisco, and then traveling to South America, Ceja had to decide whether and when she would join the family business. Arriving at Ceja Vineyards on a cool spring morning, one is struck by the impeccable landscaping – just one of many signs that the Cejas take pride in their work. 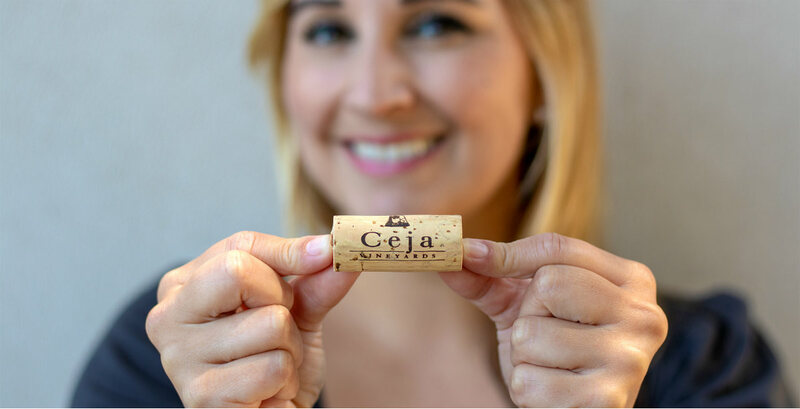 Ceja was founded by Amelia and Pedro Ceja, Pedro’s brother and winemaker Armando Ceja, and his wife Martha. As one of the few Latina women in wine in California, Amelia Ceja is determined to help shape the future of the consumer’s comprehension of—and abilities in—pairing food and wine. “I want to be thought of as being instrumental in breaking down the barriers of the mystification of wine,” says Amelia, who was appointed President of the Carneros-based winery when it was founded in 1999. My husband and I lived in Sonoma for six years. I loved our life, and I loved Sonoma, so much so that I wrote a travel guide to Sonoma’s small family wineries. Then, in 2007, my husband announced over dinner one night—and with heartbreaking appetite—that he wanted a divorce. I fled to New York for nine months, but I had to return to California because I had promised my publisher another travel guide, this one to the small family wineries of Napa. Napa y Sonoma, California - El apellido Ceja se ha convertido en sinónimo de buen vino, no solo para los conocedores y catadores de vino en Estados Unidos sino a nivel mundial. In Washington DC, the Napa Valley is not just the toast of the town—wines from the acclaimed viticultural region delivered the first toasts to Barack Obama as 44th President of the United States. A work of art depicting more than 8,000 years of viticultural history may not seem a likely fit on a 4-by-14 foot canvas, but that didn’t stop artist Maceo Montoya. Montoya was commissioned by Ceja Vineyards to create a mural of the history of winemaking, from 6,000 B.C. to today. Passionate and fearless could equally describe Amelia Morán Ceja, president of small upscale wine producer Ceja Vineyards. The first Mexican-American woman to run a wine production company, Ms. Ceja is proud of her cultural and culinary heritage. As far as the Cejas are concerned, it’s not only about wine. Their decision to locate an inviting, elegant tasting salon in downtown Napa came from a desire to provide the community with an opportunity to explore Latin culture through the arts, through cuisine, as well as through the family’s approach to winegrowing. Adonde quiera que va, Amelia Morán-Ceja lleva muy en alto el nombre de su compañía. A ella no le interesa lucir adornos que la hagan ver como una gran ejecutiva, aunque lo es. En toda su ropa de trabajo tiene grabado el logotipo de Ceja Vineyards. NAPA - The afternoon sun hung low over the Ceja family's vineyards and beamed through the window of the tasting room, warming a hardwood table filled with Mexican food and wine produced by farmworkers who realized the unlikely dream of becoming owners. She’s a five-foot tall colossus of whit, strength, enthusiasm and intelligence. But most of all, Amelia Morán Ceja possesses in her diminutive body, enough energy to power the electric grid of the entire Napa Valley. She's a five-foot tall colossus of wit, strength, enthusiasm and intelligence. But most of all, Amelia Morán Ceja possesses in her diminutive body enough energy to power the electric grid of the entire Napa Valley. Napa (California) – El sueño de tener nuestra empresa de produccion de vino propio viñedo esuna realidad para mi familia mexicana de Napa. Ceja Vineyards se fundó en 1999 y en menos de cuatro años, se ha hecho un nombre por su calidad y compatibilidad con la comida mexicana e internacional. Yo fuí elegida primera mujer mexicana presidenta de un viñedo de la región de Napa y Sonoma. Amelia Morán Ceja met her husband, Pedro Ceja, when both of them were Mexican-born teenagers whose families had immigrated to Napa Valley. As Hollywood might have it, both were working in the same vineyard as teens. Today, Amelia is president and chief ambassador for Ceja Vineyards, and Pedro and his winemaker brother, Armando, are co-owners. Amelia Morán Ceja is a woman who is always on the move. When she's not on the road selling Ceja Vineyards wines, she's in her office doing the multitude of tasks that a winery executive must do. She's also a chef, preparing Mexican dishes for visiting dignitaries and for friends whom she frequently entertains at home. A generation ago, many Americans viewed wine as the purview of pompous white guys in tuxedos sipping claret from crystal glasses. The only ethnic market for wine was Italian immigrants. African Americans and Hispanics were invisible to the wine world. They come from Michoacan, Jalisco and Zacatecas, from tiny farming villages like Haro, Las Flores and Aguililla, where they grow corn, beans and fruit and get barely enough compensation to make ends meet. It comes as no surprise that one of the newest entries in the local wine trade is Napa's Ceja family. Virtually raised in and around Napa Valley vineyards, brothers Armando and Pedro Ceja spent after-school hours and summer vacations learning how to graft grape varieties, prune vines and taking part in the harvest every fall.